I have this theory, or shall we call it a personality disposition, that nothing is ever really perfect. While I would argue this pickiness is unfortunate outside the kitchen — “This date would have been even more perfect if I’d ordered the eggplant and not the chicken.” “I love my haircut except this completely unnoticeable thing going on in the back.” — within the confines of the galley walls, I think nit-picking, when done quietly, helps us become better cooks. Though a big fan of the small nuances that remind you that home cooked food is precisely that — tart crusts with the inevitable corner pieced together from a scrap, a dark spot on loaf of bread that wasn’t rotated in the oven in time — I find it nearly impossible to eat something I’ve made without making a mental note of how I’d do it differently next time. More hot pepper. Less baking time. Ease up on the olive oil. Blanche the peppers for thirty seconds less. Which kind of brings us to the lemon pound cake (made here in bundt form) from Ina Garten, a name I’m almost embarrassed to mention I am using as a source once again, as I know I said just a couple weeks ago that we should spend some time apart. I can’t resist this cake though, I think it’s one of the ten great cakes every cook should have tucked into their repertoire. It’s buttery yet bright, and nearly every granule of sugar has been countered by fresh lemon in some form so it never lands cloying or saccharine on your tongue. It keeps well, travels wells and if you make it in pound cake form, you even have an extra that you should feel in no way obliged to share. So Debbie Downer, what went wrong this time? Well, the lemon syrup that in basting the warm cake with, raises it to that higher plane of moisture-packed crumb, it wouldn’t absorb! When the large spoonfuls rolled down the sides and pooled at the bottom, I made them smaller and smaller until I could find an amount the cake would agree to absorb – but one or two droplets at time. I suspect this is something like feeding a child, where you beg and plead for the thing to just take in two bites and we’ll call it a day. But, as no child’s well-being rested on the absorption of syrup, when fatigue called twenty minutes into this expedition, I simply dumped the remaining liquid over the cake, absorption be damned as it flooded the plate underneath, gumming it nearly permanently to rack underneath, which is by the way the second thing I would do differently next time: not let the cake cement itself to its base, so that when it needs to be transferred to a cake carrier, it loses small chunks and the otherwise flawless white glaze becomes cracked. I remember having this problem the last time I made the cake, but it was less significant in the pound cake form, with its more level top surface. Yet this time, I could taste the lack of extra moisture. Without that basting, this cake is wonderful, but a lot more like the simple pound cake it’s based on. Not sure how I’ll do it differently next time — would a lemon syrup-filled syringe be considered a step too far? — but without a doubt, I will be musing over this for a while. Let me know if you’ve tried this, and found anything that worked better. My unrelenting inner persnicketer is dying to know. 2 cups (240 grams) confectioners’ sugar, sifted. 1. Heat oven to 350 degrees F (175 degrees C). Grease and flour two 8 1/2-by-4 1/4-by-2 1/2-inch loaf pans, and line the bottoms with parchment paper. I really like the way your icing looks! And unfortunately I can’t recommend something better… I would suggest however, asking http://www.culinaryconcoctionsbypeabody.com/ how to fix it, she’s doing things with cracked cheesecake I just wouldn’t think of! Using a bundt pan just dresses things up so much more than a rectangular cake. One option might be to use a skewer or a toothpick (or hey, even a fork) to poke holes into the cake before spooning the glaze over it. It will help the syrup get into the cake more easily. This is how I make my grandma’s lemon drizzle cake arren I make it in a Bundt pan. I also add the drizzle while still in the pan from the bottom. That way any that doesn’t absorb there heads to the bottom of the pan (top of cake) and soaks in there. Brilynn – Thanks, I’ll have to check her out. Gretchen – I tried that, but maybe not enough? It seemed like a lot of holes. Coincidentally, I saw this similar suggestion on Chowhound today, convincing me that I should do more next time. Since you coat the top with the liquid icing sugar, you never see the holes anyway. Bawdy – I’ve been tempted many times, hand squeezing all those lemons and straining the juice, to use bottled but I agree there is no comparison. Next time, I’d like to make this with meyer lemons, if I can find them without breaking the bank. As you know, I didnÃ‚Â´t have much luck with the syrup either. In my case, it was because the syrup was too thick, so if thatÃ‚Â´s the case with you, IÃ‚Â´d try making it more liquid. Another tip IÃ‚Â´ve heard for this type of cake is to have two different temperatures: that is, if the syrup is hot, the cake must be at room temperature, if the syrup is cold, the cake must be hot. Apparently, if both things are hot or cold, the cake wonÃ‚Â´t absorb the syrup properly. IÃ‚Â´m gonna try this recipe myself again and see how it goes, since it had great potential and was yummy even with this problem. When i removed the cakes from the oven I immed ladel the syrup (hot as well) over the cakes… I let them sit a few mins then flip them over so the syrup absorbs more evenly. I’m going to introduce it as a cupcake around Christmas.. My customers love all things lemon. I’ve never followed this recipe, and this approach might be riddled with problems for other reasons (like making it hard to turn out of the pan), but you might try putting the syrup on right out of the oven while the cake is still in the pan, and then turning it out – that way the syrup has no escape. It’s worked well for me in the past…. I made the white batter bread today with hummus for some friends, and all I have to say is THANK YOU! It was awesome, totally moist and delicious. It turned out great even though it was my first attempt at bread (iÃ‚Â´ve made pizza before, but not bread). Of course, it helps that IÃ‚Â´ve seen my mom make bread tons of times and I know how the dough is supposed to feel, but still, I think virtually anyone could pull it off. I don’t think the syringe filled with syrup is in any way over the top. In fact I think its the perfect idea esp if hte syrup and cake are both hot. I love this site…the recipes…the ideas. Its going to make me so fat. That looks so good! I am one who loves all things lemon. I highly recommend eating the lemon cake while drinking pinepaple white tea. Actually, it’s probably better that you don’t. Once you start, there is no stopping. I interpreted “invert them onto” as “flip them out onto”, because the first time I made cake, I did the former and ended up with a really messed-up top where the lovely curve top of the cake gummed itself to the rack as it cooled. That said, when I did it the first way, I definitely had the best absorption, as when you peel back the parchment paper, you have a nice porous surface. (Needless to say, the bundt cake pan wasn’t lined with parchment paper!) Since then, I have assumed she meant the more-traditional “flip them out onto” so the cakes cool right-side up, as they do in most recipes. Which leads me to believe Cupcakes has the right idea, and also bragging rights (heh) because she’s never had this problem: a couple minutes upside down and then cooling it the rest of the way right-side up. But, this doesn’t really solve the same problem for Orange Chocolate Chunk Cake, which is intended for a bundt pan. (I forgot to mention that they are really the exact same recipe, with, you know, the orange replaced for lemon and added chocolate.) I had the same problem when I made that a couple weeks before, but I was more patient, not quitting until every last drop was painstakingly dribbled on. In both cases, I ended up using a pastry brush, but it didn’t make it absorb much, just gave them both a shiny-ish and not-very-pretty exterior. See how the syringe idea gets more and more tempting? 343 words on syrup-basting techniques! I think this must be a record. Marce – Glad you loved the white batter bread. Jen – I totally want to make that cake, too, but you see, I have these people (SantaDad, husband and most of the Russians) who don’t understand the purpose of non-chocolate desserts and occasionally even heckle them. What pests, right? Why are you trying to make me fat? Seriously, can’t you write a diet or exercise blog? I’d even accept one about personal growth (although I would complain bitterly about it each time I see you). This only makes me salivate all day and then return home to an empty kitchen full of take out menus and bad ideas. I blame you for my weight gain and Jocelyn for my drinking problem. I’m so glad there are blogs so I don’t have to take personal responsibility for anything. Aria – And you can even make it a day in advance, maybe two. I think it keeps pretty well. You can put the white glaze the day you want to serve it. Jill – I mean, I could be. I did bring like 150 miniature cupcakes to your apartment a couple weeks ago, way more than you’d ever need. But, my cruelty seems fair in exchange for the new liver Alex will have to buy me before I’m 35 due to the excess I’m incapable of saying no to in your presense. That said, my diet blog would be heinously boring. “This morning, I had Stoneyfield Farms Strawberry Yogurt with 1/8 cup Bear Naked Granola and an iced skim no-foam sugar-free latte. For lunch I had steamed vegetable dumplings and a green salad…” See, I did. But you’re already sleeping. Shoot, I’m already sleeping. Anyway, you should make these or these for you and Joc. Healthy and tasty! Zzzzzzz…. What you can do is take a tea towel/hand towel and that pretty new pot alex bought you (blah i want 1) and make a lil bed for the crown of the bundt to rest on so it doesnt smush.. pour on the syrup, let it sit and take it off the tea towel and let it rest so the syrup absorbs more evenly. The problem with trying to use any syrup on the top part of the cake is the cakes surface.. it has a “crust” so to speak.. the heat from the oven basically seals the top of the exposed surface. The analogy you used about the parchment paper is great, i was trying to think of a way to describe my point..
Thats why you’re the writer and Im just Tims crazy stalker. Personally I think that your cake looks fab. I recently used a Stephanie Alexander recipe for a glazed lemon cake – not using a bundt, and using granular sugar and a hot syrup over a hot cake gets great absorption. Also the cake is glazed while still in the pan – leaving the glaze to simply sink in. Personally I like it when glaze dribbles down the side of cakes. It says something about abundance and that is what cakes are all about! Deb. I just realized…in over a year of reading and posting on blogs…you are the nicest blogger I have ever met. You always make an effort to respond to multiple peoples posts, and, so far, you are the only one I have ever been to that really does that consistantly, if at all! I just had to say that, because you are the first blog I ever read consistantly, and you are like, still the best one. Funny, in a neat kinda way. I poked holes in the BOTTOM of the cake[s] with a long metal skewer (didn’t want holes in the top and I, like you, read the directions to say to turn cakes out) and poured the syrup in from the bottom and let the cakes settle/soak on wire racks. However, I made several individual pound cakes with the recipe, rather than one bundt cake. You know, I followed the recipe to a tee and I found it overly lemony and soursweet. I didn’t love it and I was so disappointed because Ina loves the many steps when it comes to cakery baking. A year Later! I am just seeing this recipe now yet am feeling compelled (by the glaze ghost?) to respond. The instructions say to cool the cake completely before pouring the glaze over it. This is why you were having the glaze absorption problem. The cake has to be warm when pouring the glaze onto it. The cooler the glaze is, the warmer the cake has to be for it to absorb the glaze. I see that #5 Marce responded with the same type of solution. I’ve been looking for the perfect lemon pound cake recipe-thanks! This is so, so yummy. Made it over the weekend, “one of the greats” is right. I’ve made this recipe about 5 times now over the last year. I’ve completely eliminated the powdered sugar+lemon juice glaze, it doesn’t need it, in my opinion. It tastes like lemon glue to me. By the 3rd time, I went the bundt cake vs pound cake route. I allow it to cool about 15 minutes, flip it right side up onto an open grid rack. Then I used a pastry brush & painted the lemon juice+sugar syrup all over it, allowing it to drip off & through the rack, therefore no soaking of the bottom. I didn’t even use all of the syrup. I’d rather have it less moist vs gummy…blechhhhh. This recipe also works really well as a cupcake without ANYTHING else on it. I recognize that this may be wayyyy too minimal for some folks but, I’m telling you, it works, it’s yummy. So there you have it! I am curious about the need to both grease and flour AND line with parchment paper. I just started using parchment paper for cookies and such, but thought that the whole idea of parchment paper meant you don’t need to grease and flour everything first (this is usually a messy affair, and I don’t like the little clumps of flour and layer of flour on my cakes). By the way, this cake looks wonderful! I was looking for a recipe to use up some buttermilk that’s in the fridge. I’m off to buy some fresh lemons! – i too am interested in knowing if this would be too heavy as a layer cake. – also does anyone know how many cups of batter this recipe makes? – in previous posts (#6/#15)there was mention of a chocolate version. where can i find the recipe? Pound cakes are generally too heavy for layer cakes, but it is not that it can’t be done. Personally, I’d use more of a traditional, lighter layer cake. Bundts hold about 12 cups of batter if filled to the top, this is probably less (maybe 10 cups). There is an orange chocolate chunk cake also in the archives, very similar to this. I made the lemon pound cake yesterday and I had a problem I’ve never experienced before. They fell just before they were due to come out of the oven. Have any of you experienced this with this recipe? The cakes look funky but taste wonderful! Hi guys! This looks like a really great recipe…I’m trying it out as a cupcake. Any recommendations about baking times? Also, I’m freezing them for future use, would that compromise the texture? Thanks, and thanks for the great recipe! I am about to confess something semi-shameful: my dad requests the old Bacardi Rum Cake every Christmas, which requires a lot of soaking in rum glaze. So I bake the thing, turn it out of the pan and brush glaze on it. Then I pour some glaze into the Bundt pan, drop the cake back in there, and pour over the rest of the glaze. The cake sits in its little bath of rum and liquid sugar, and turns out gorgeously with only the slightest bit of syrupy rivulets. The idea of putting the cake back in the pan is scary the first time, but now I hardly have to think about it. *g* I am SO looking forward to trying out this fantastic-looking lemon cake in the same way! I just wanted to jump in and say hi to all the wonderful people on this blog. I just discovered this site through Alexis Stewart’s blog and love all the fabulous recipes and helpful comments. Deb, you are truly a gift to us. Wherever I went wrong it was a good place.. well I know, I made one cake not two and started out halving the ingredients but then forgot and added the doubles, roughly as is my want – so 250g butter, 1 1/2 cups sugar and three eggs, 4 lemons but they were good ones, 2 cups flour and everything else sort of approximately as suggested, poured the syrup and the glaze over soon out of the oven and tried the flipping it over things, and all in all – wow, pretty good cake. Served warm and fresh. Could only be made wowier with lemon curd icecream.. I used a bundt pan–the two-cake recipe works nicely for one bundt pan. I tried drizzling the syrup on partly with the cake upside-down and the rest right-side-up, that seemed to work nicely. When I was putting on the glaze I wasn’t sure if I needed an entire recipe, but when we ate the cake, everyone wanted extra glaze, so I definitely wouldn’t skimp on it in the future. Anyway–everyone loved this cake. Thanks for a great recipe! Which part of the recipe is the syrup? I can’t determine it. It’s step 4, the combined 1/2 cup sugar and lemon juice. I just made this over the weekend for my mother-in-law’s birthday. It was a BIG hit! You’re right, definitely a top 10, especially in a bundt pan. I actually tried the syringe method after reading the comments and it went pretty well. Still a little tedious, but definitely worth the extra time. This recipe is definitely a keeper. THANKS! ok, the two piece tube pan did not work. my cake fell apart. so my family got to eat some of the ugly cake. and, it tastes yummy! second try in loaf pans was great. they look pretty, just a tad small. zesting 12 lemons was SOOOO worth it. I have just found this website, and absolutely love it. Cooking is fun for me, and I’m always looking for new ways to do stuff. All you people who comment on the recipes are probably very much younger than I am (you all talk like my grown daughters), but the love of fixing food is a great equalizer. Anyway, this recipe is similar to an orange cake that I have made, and the trick is to first use a skewer to punch holes in the top of the cake and then pour the hot syrup over the cake when it comes out of the oven and still in the bundt pan, then leave it to cool off before taking it out of the pan. Put the glaze on when the cake is cold, and you could put wax paper under the cake in three or four small pieces which you can pull out when the glaze is cool. Thereby leaving no messy plate. I am making this cake for my husband’s 86th birthday. I do the lemon pound cake from Everyday Food all the time and if you poke holes in the top with a skewer (lots of holes) while they are warm and the syrup is warm it does get in there and then the holes get covered with the icing glaze at the end. They will never get a moist as my grandma made (she died with that secret – well I never thought to ask!) but they are a close second. And a really yummy tip for this – skip the icing glaze, make a summer berry sauce (we have TONS of blueberry farms here in Mission), cut off thickish slices, grill them and pour the warm sauce over them. YUMMM!!! And don’t forget that glass of bubbly! the syrup thing does not work for me, i poured it while the cake is still hot in the bundt pan. i didn’t want to poke too many holes in the cake so the syrup only soaked on the top and sides of the cake. Delicious nonetheless! Maybe next time i’ll try to use a thin long prong or needle instead of the fat skewer i had.. I found your site about two months ago. Your recipes are absolutely fantastic. I know this is an adaptation…but I love this recipe any way. This may be excessive, but this is what I did with the lemon syrup. I think I poked about 100 holes in my cake with a metal testing stick. Then I took a skinny baster and dribbled the syrup on the cake very slowly over the holes. There was still a lot of syrup run off, but it absorbed a lot of it. I modified the glaze and made a raspberry glaze. The pink glaze contrasted nicely with the cake, and it was a nice balance of tart and sweet. I garnished with fresh mint and fresh raspberries. So, I FINALLY made this. It was great, very lemony pound cake….. Ate way too much and no regrets! Looks delicious, but I don’t have a bundt pan and would still like it to look nicer than a loaf; can I make this in a spring-form pan? Check out this awesome page for cake pan size conversions. I have only done this in the bundt or two loaf pan versions. I make a key lime version of this cake, and what I do is cool the cake for 15 minutes, while still in the pan, then jiggle the pan to ensure the cake is loose, then skewer holes into it, and pour the syrup over the top of the cake. I leave it soaking in the pan for 10 minutes, then pour off the syrup that has pooled to the bottom of the pan into a measuring cup, and then pour it back over the cake. This sits for another 10 minutes before I turn it out onto a wire rack. For anyone else going to try this, I had great success using a basting brush to get the syrup on. It really was too difficult using the spoon, lol. i also had great success with a basting brush! great cake. This is IT! The perfect lemon cake. Tastes just like the one I buy at Starbucks. Its a little labor intensive and I had problems with the lemon syrup soaking in too. I do think next time I will make the syrup with a tad less sugar and a bit more lemon juice, then poke holes in it. That lemon syrup really makes the flavor POP! I also noticed it dries out super quick. So wrap it up tightly with plastic wrap. THANK YOU for your recipe find! the best thing about your blog is the wonderful pictures :) I just discovered this page and now visit everyday! Made this as a bundt cake last week and I also had trouble with the syrup which I tried pouring while both cake and syrup were still warm. The cake itself had great flavor but I thought it was a little drier than I would have preferred. However, the texture improved over a few days and my coworkers loved it when I took the leftover half to work. I also brush the syrup on when the cake is straight out of the oven. Works great for me! I also poke a few holes in the cake with a toothpick for better absorption.. Thanks for this recipe – I made it once at home, then a few weeks later for a party, because it was so, so good. I overheard someone who didn’t know me saying, “Oh my god, did you have that lemon cake?” It was a hit all around! Hi, I halved the recipe but it turned out just as amazing as promised! two people already asked me for the recipe and I’ve directed them to your site. Thanks for sharing! I’ve been making recipes from your website for some time now but this is the first time I have reviewed a recipe. Like you, I love the art of cooking. I just wanted to say thanks for all the wonderful stories and recipes. As for my review of this lemon cake well…it was wonderful. My family especially loved the fantastic texture of the cake. I am going to make it again soon using orange instead of lemon. My husband even requested it in grapefruit! I might just give that a try. He does have good ideas from time to time. I’ve been wanting to make something that I can bring into work for a treat and finally settled on this. Not quite enough lemons, so I usaed half lemon juice, 1/4 lime juice and 1/4 run and just mixed them together so some of it went into the cake, some was the syrup and the rest was used to make the glaze. Sooooo good. I had to immediately freeze 2/3 of the cake I was keeping for myself so I wouldn’t eat it all. Now I want to experiment with using combos of citrus & herbs in the future. I am thinking lemon & basil, pineapple & rosemary or orange and tarragon!! I have discovered your website and I think I’m going to love it! I love all the ideas and the discussion. Looking forward to learning from all of you out there! PS Liz – I would have never thought to put lemon and basil together! Mmmmm sounds delicious! Thanks for your site, and congrats on your wee bairn! deb, why is everything you make wonderful. Seriously. Hi! Commenting from Canada. How much are ‘2 sticks of butter’? Thanks! I have really had a craving for lemon cake lately. 2 sticks of butter equals 1 cup. Hi! I somehow stumbled onto your site and it is great! The photos look amazing too. I had a look at the cake pan conversion page you mentioned but I don’t really get it, so thought I’d ask. I don’t have a bundt or loaf tin, could I make this in one 8in round deep cake tin? Or would I need two of those? Might have to buy a bundt tin cos it looks so pretty! I can’t wait to make this cake! Thanks! Also, slightly off topic – do you have a recipe for a Key Lime Pie – I am from England, so after some Google searches, am still a bit confused as to a traditional recipe (and I’ll have to just use regular limes)! sorry to be so late(9 years later; wow) Enjoy! A very good cake that I will definitely make again. I made 2 loaf cakes to give to 2 neighbors as thank you gifts. I had a 1/2 pint of raspberries on hand so I added them. First, however, I tossed the raspberries with 1 TBS of flour. i am planning to make this cake this weekend for my sister’s birthday. she is a huge fan of lemon. the party is on saturday, but we will be travelling on friday. can i make this and freeze it? or if i make it on thursday, will it still be good on saturday? any suggestions? It will freeze well. I would not glaze it until you are ready to serve it, however. made this (with only one lemon). delicious! Excellent!! I didn’t have any ‘absorption’ problems. I think hot cake, hot glaze and a brush instead of spooning is the trick. It really was phenomenal and I took it to work where there was moans from the entire floor! I was planning on making gingerbread cookies today (have some molasses I need to get rid of), using Martha Stewart’s recipe, but I wanted to add a citrus-y zing to them, kind of like lebkuchen. Do you think that this glaze would work well on cookies? Would I need to make adjustments in amounts, etc.? Thanks! Sara — This is not a glaze that hardens. For cookies, you probably want a glaze based on a Royal Icing. Martha Stewart has many recipes/approaches to it on her site (such as linked from those snowflakes, which I made in December and were the spicy-best!). I poke the cake with a toothpick as soon as it comes out of the oven and pour the syrup on before turning the cake out of the bundt pan. I haven’t read through everyone’s posts, so it’s possible someone has already suggested this. But when I make my lemon cakes (not this recipe, but my own concoction), I spoon the hot syrup over the hot cake while it’s still in the pan… just pour it over. Let it cool about 10 mins, then unmold. Any longer cooling time and the syrup will cause the cake to stick to the pan. I believe this is actually how some of those famous lemon cake bakers do theirs, too – pouring hot syrup over hot cake. Both have to be piping hot in order for it to absorb into the cake. It looks lovely, however, and I’m actually going to try this recipe out. I haven’t made mine in quite some time and never really wrote it down completely, so I’m hoping this one will turn out even better than I remember mine being! Okay so I realize this recipe/posting is years old but I was wondering if you solved your icing dilemma? A trick I learned when working at a bakery was to take your reserved lemon juice and slowy, over a couple hours, work in some regular sugar to make a simple lemon syrup. Making sure not to stir for at least 30 minutes before you apply to your cake to let the undissolved sugar sink to the bottom. Then dab on the cake with a pastry brush taking care not to hit the sugar at the bottom of your bowl, and coat the cake two or three times. Perhaps you already use this trick/syrup and want a nice white frosting-glaze on the cake, but the syrup certainly makes a nice moist cake. Which, after reading this recipe, I will be making this weekend.. Thank you! This cake was a big hit our get together last night. I handled the lemon syrup absorption the way another poster recommended. I took the cake out of the bundt pan, poured lemon syrup into the bundt pan and returned cake to pan and let it sit in the syrup for awhile for it to absorb. I did this while the cake was still hot, right out of the oven. When returning the cake to the pan it cracked a little — but not so you’d hardly notice. I also froze this cake (glazed) about a month before serving it. I think the glaze would have looked a better had I put it on the cake after thawing. Bright lemony flavor and so moist. Perfect lemon cake in my opinion. Thanks for another great recipe. Honestly, if I had read through the whole recipe before starting I might not have made this. But I’m glad I did! I used a bundt pan and dealt with the syrup issue by pouring half of the hot syrup onto the cake immediately out of the oven while still in the pan. I let it soak in (with the help of a brush) for 10 minutes. Then I dumped the cake upside down onto the plate, poked some holes with a toothpick and brushed the rest of the syrup onto the top of cake and around the sides. It all soaked in no problem! This is a very lemony cake and soooo good, especially with the glaze in addition to the syrup. The consistency is perfect. Lighter than as a true pound cake but more dense than a regular layer-type cake. Yum! I was craving lemon cake .. don’t ask. I used disposable loaf pans and poured the hot syrup over the cakes as soon as they came out. But being disposable I was able to bend out the sides of the pans and let it drip down the cake. Easy as pie! I turned them over a couple of minutes later. its still hot … but i know its gonna be awesome, your recipes always are!! The Lemon cake that I always make is “The Best Damn Lemon Cake” from Maida Heatter’s New Book of Great Desserts pg. 113. I has ground almonds in it…the secret to getting the lemon glaze to absorb entirely is to make the glaze the last 2 – 3 minutes that the cake bakes…then remove the cakes from the oven and let them sit for 2 – 3 minutes…Then apply the hot glaze with a brush over the Hot cake..do it slowly – it should take about 5 minutes to finish this part. Let the cake stabd until tepid, not completely cool and then invert it onto a cake rack (gently turn the cake over) and cool completely. My late husband loved this cake…and it is still my mother-in-law’s favorite which I need to send to her for her birthday. If you apply the glaze this way you will NEVER have any problems with it plus the hot cake absorbs the entire amount of lemon syrup…remember to apply it slowly…the first time I made this I wasn’t patient and just poured the syrup on the cake in one motion…result soggy cake…that never absorbed the syrup. I also set wax paper until the cake rack to catch the extra syrup and use wax paper when I wrap it up. I always refrigerate the cake before serving it..as it is best the next day and slices like a dream when cold…this cake also freezes well. That is if no one eats it before it cools, etc. Take your time with the syrup and you will certainly be rewarded. My customers love this cake. Just made this tonight! It was awesome. I made mine with Nova Tangerines (zest and juice) instead of lemons though. Thanks for the recipe and the inspiration as always. I’ve been working my way through your stuff, and nothing has failed me yet! Thanks!!!!!! Made this around the holidays & it was a big hit — vague recollection of painstakingly apply syrup to the hot cake. I now want to d the bundt version for my sons first communion (he asked for a lemon cake!) So, apply the syrup, let it completely cool wrap it really well? Glaze once it’s defrosted? I am a great cook, clueless baker and never a freezer – help! Holly: I am no expert, but just to share, I used pretty much the same freezer procedure you outlined, and it worked great. I baked the cake on Sunday for a party on Tuesday. I applied the syrup, let cool completely, wrapped first in wax paper then in plastic wrap (the wax paper really helped since the syrup made part of the cake dreamy-sticky-good), froze for a couple days, then let it defrost and poured on the amazing drippy glaze. It was still moist and delicious and, as I said, a hit :-) I love how this cake freezes, definitely a good mid-week party cake for that reason. I made this twice in one week it was so divine, I brushed the glaze over a still warm cake in the pan and it was worth the time it took. I will be making this again soon, perhaps in muffin cases and will try to freeze it. Great recipe. I made this last night, and opted for the two loaf pan cakes. The syrup went on fine and almost all of it absorbed, but I can see how the round edges of the bundt cake would make it tricky. I put one in the freezer as soon as it cooled and will bring to NH this weekend for my brother and sister-in-law. Perfect! Hi. I’m looking to make a homemade lemon cake for a friend this weekend. I noticed that this receipe is more of a pound cake. Is there anything i can do to this pound cake to make it like a birthday cake? More fluffy and soft. Do you think a buttercream icing would taste ok with this? Thanks for any advice or comments! You might enjoy the lemon layer cake in the archives. Hey Deb! Do you know if you could possbily freeze the loaves and have them still turn out well after thawing? Thanks! Hi Jenni — Well-wrapped, they should freeze well. Do the glaze when you’re ready to serve them. I think I may have solved the syrup absorption problem. I baked my cake in a 9in Spring Form lined with parchment paper. The cake had a nice dome, which I cut to be even with the pan, after it had cooled for 10mins. I drizzled some syrup on the top before flipping it onto a plate, removing the parchment and pouring the rest of the syrup. It soaked in brilliantly, and looked much nicer than a loaf pan. Easy, peasy, lemon squeezey. :) The cake was delicious. Thanks for another great recipe! Hi Deb – this recipe was my introduction to your wonderful site! I used a basic squeeze bottle to apply the syrup. (http://www.amazon.com/12-2doz-2e-Squeeze-Bottles-pk-2e-Clear/dp/B000QJBNII) Applied slowly and directly, it worked beautifully – a modified “syrup-filled syringe,” I guess. Just made a lemon cake for a friend’s birthday today and it was beautiful. People really enjoyed it. You have done it again. Keep posting great cake recipes. Craving a fresh-tasting dessert, I made this cake today. I couldn’t even wait for the glaze, I cut a piece off after putting on the syrup. Great flavor! The cake was a little more labor intensive than I prefer (can’t do better than a one-bowl recipe), but this is well worth the effort (and dishes). I halved the recipe, using just one loaf pan, and baked it 40 minutes at 325 in my convection oven. Yummy! we didnt make the syrup and we halved the recipe, but our major change was adding in a packet of raspberry jello mix to half the batter and then swirling the two batters in the pan… to approximate the raspberry swirl pound cake from Starbucks that my 6 year old fell in love with on vacation. And as she said, it takes a little like a pop tart :-) It’s a great cake, even with the jello mix in it… and I cant wait to make it again in a more grown up way! This cake was improved with the addition of 1/2 cup poppy seeds. i’ve made this cake and it’s SO good. i love the recipes you post. i’ve tried out a few deserts so far and all of them have turned out amazing! So maybe it has been way to long for you to still want a tip on this matter, but just in case…. My tip: dip a wadded up paper towel into the basting liquid and while gently squeezing press it into the cake. It will force the fluid in and allow more time for this to happen with less loss of your basting yumminess. I hope this helps you as it has for me when making my mother’s Rum Cake at the holidays. I learned it in a pinch one evening when I realized my children had used my only basting bush to “clean” the fence in the back yard and it was left resting in a pile of wet leaves and who knows what. It makes so much less of a mess that I now prefer to do it this way. I will be trying this cake soon. Thanks for the recommendation. I read most of the 98 comments trying to figure out how to line my bundt pan with parchment paper. Is this a necessary step? Nothing worse than a cake that is stuck in the pan–I don’t want to mess this one up. The cake sounds delicious. My husband loves lemon cakes so I’m anxious to try this one and share it with our guests this weekend. Reading the rave reviews makes me anxious to try this one! My bundt cake looked so beautiful and I waited a few minutes before turning the pan over to remove the cake. I buttered/floured the pan but did not use parchment paper. When I turned it over the cake partially broke apart and the rest stuck to the pan – I was so bummed. What did I do wrong? Supposedly it is a nonstick bundt pan. I have made this cake several times and what has worked best for me is to “shave” the top crust off. You couldn’t do this with a bundt very easily but it works well with a loaf cake. Get a serrated knife and just carefully trim the hard crust off the top. Be very careful when you get to the edges or they will break away. You only want to just break the surface.Then the syrup absorbs perfectly. Of course your cake doesn’t look quite as nice but you can hardly tell once you put the white glaze over it. I’ve made this cake several times in the loaf pans. To get the syrup to absorb, I let the cakes cool in the pans for about 5-10 minutes. I then use pot holders to coax the cakes out onto a cooling rack. I pour half of the glaze into one pan and half in the other. I ease the cakes back into the loaf pans and wait until they cool but are still warm (about 20 more minutes). By this time, all of the syrup has been absorbed and I am ready for the glaze. It really works. Thank you for the bundt cake idea! Deb, have you tried the “Lemon Lemon Loaf” from the Baked cookbook yet? I made it yesterday with meyer lemons and I had to freeze the second loaf for fear we might finish off both loaves in a matter of days. A real problem once you see the amount of butter in the recipe. This cake rocks! It is so moist. Thanks for the recipe! I made this over the weekend with sour cream instead of buttermilk (coz my local supermarket was out of the latter) and it was amazing – even better than the buttermilk version I’ve made previously. The texture is a little denser, and with a finer crumb. I thought it kept better as well. Just polished off the last slice on day 3 and it was still as moist and delicious as on day 1 :-) Thanks for a fantastic recipe!! I just came across this – so maybe you have your lemon syrup issue resolved by now, but when I make a cake like this I use a basting brush to brush on the syrup. I never have a problem with the liquid not absorbing. I think you could use a pastry bush too, but the one I use is specifically for brushing on bbq sauce and the like. I’ve got to say that this cake – and the chocolate/orange version on this site – are the best go-to cakes ever. I’ve been making this one for a few years (sometimes sans icing and just powdered sugar) and the chocolate/orange for the last few months and they are both so well received. Easy, quick, and such delightful flavors. What works for me, I found this on Americas Test Kitchen, cool the cake for ten minutes, pour half the glaze on, wait another hour and pour on the rest of the glaze. I am completely impressed by your icing job. Any tips on how you made it so lovely?! I’m making this this weekend for Easter dinner. YUM!! Baked this yesterday. It was delicious and loved by all. Just a note, I have this fabulous glaze which is basically lemon juice + honey, brough to a boil and then drizzled. I tried this instead of a sugar glaze. The cake swallowed it up and all was bliss. This cake was a hit at our Easter celebration this weekend! Once again my sister, who doesn’t really like lemon cakes, was in love! It’s the perfect combo of lemon and sugar. So moist and delicious! I will definitely make this again! Best lemon cake I’ve ever tasted! Thank you! Put the syrup on when the cake came out of the oven: some on the bottom before inverting it and then the rest over the warm top as soon as I took it out of the pan. Soaked right in and then the glaze on the cooled cake really took it to another level. Fantastic recipe! Zingy with lemony-ness but not overly sweet or tart with an excellent fine and soft crumb. I’m in Australia, so used 5 extra-large eggs (about 280g), making my batter a little more eggy than the recipe as written. I will definitely be making this again, but may leave the syrup off one cake next time just to see what it’s like and think an orange version would be good to try too. I made this cake recently, and it was lemon perfection. And I don’t even care for lemon desserts. My one problem was that it wouldn’t come out of the bundt pan. Like, at all. Despite my family’s best efforts, the cake wouldn’t budge, regardless of having sufficiently greased the pan beforehand (or so I thought!) But even the pesky detail about it being stuck to a pan did not stop us from cutting pieces out of the bundt pan as desired. And, oh boy, were they desired. Delicious! Please, what are the other nine? Oh man, tough one. What I’d suggest today might have been different from when I posted this years ago, but at the very least, I’d say a New York Cheesecake, an Everyday Chocolate Cake, my family’s Sour Cream Chocolate Chip Coffee Cake, perhaps a Dobos Torte, definitely my mom’s Apple Cake and my newest favorite, Martha’s Strawberry Summer Cake. How long did you bake the bundt for? The directions, save for the small note about using a bundt pan, are all for the two loaves. I assumed it would take longer, and took it out when I thought it looked ready, I think about an hour and 10 minutes. When I turned it out though… BROWN. I haven’t cut into it yet but I think I went 5 or 10 too long. Wah. This took far too long to make, just for me to burn it!! Although the good news would be that my sugar/lemon mixture absorbed and soaked in wonderfully! Hello! So, in my family, we have a super secret, top-notch cake recipe called a Lemon-Almond Cake. It’s not really super secret because it’s pretty similar to this one, although in our recipe we have relied on Jell-O packets and box cake mixes as a base (I know, cake mix….yuck. But it’s quick and delicious, despite all those chemically type things mixed in…) In any case! On letting the liquids soak in: Our Lemon-Almond cake generally shows up in the form of a Bundt, and I normally just plop it out, poke some holes in the top with a toothpick, and spoon the glaze over the top-making sure that some of it trickles in the little holes I made. 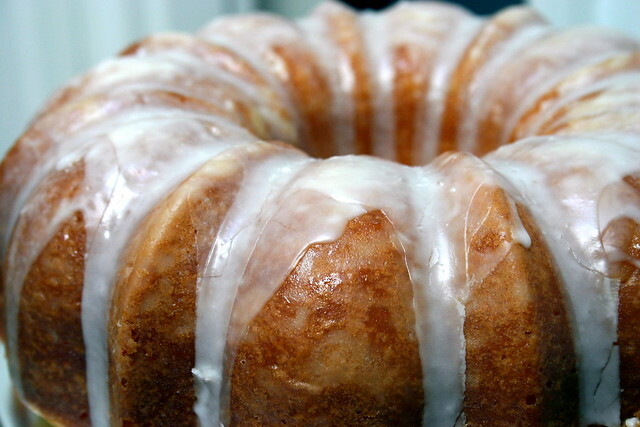 In the case of this cake, where you use a lemon syrup and then a glaze, I’d suggest letting the Bundt cool in the pan the same 10 minutes, but in that time, poke holes in the bottom of the cake with a toothpick and baste cake from the bottom. Then flip it out (onto a cake plate/carrier/ NOT a cooling rack so the syrup doesn’t leak out (I find that any steam from the cake that clouds up the cake plate actually soaks back into the cake and helps keep it moist)) and do the same to the top. Then pour the glaze over. Et viola? I hope this is a bit helpful! Hi Deb, I have a question about subbing an entire lemon for the juice and zest used in this cake. Have you ever tried baking a cake with this entire lemon technique, as seen in your lemon tart recipe? Wendy — I generally only do that in specific recipes that adjust for it. The white part of the lemon is very bitter, and requires a lot of extra sugar as compensation. Hi Deb, thanks for your comment. I tried the cake with a whole lemon. A tiny bit more bitter than the recipe as written, but in an extra lemony delicious kind of way. I have lemons ripe on my tree now (Argentina) that are not that juicy but have a great organic peel. I replaced the lemon zest and lemon juice in the cake with one whole lemon, seeds removed. I blended the whole lemon with some milk until smooth, and used 1 and 1/4 cup milk and lemon mixture for my liquid. Everything else I kept the same, including the glaze and the frosting. It was muy rico. I was google-ing lemon cakes and came upon this one on your blog. I’ve been following your blog for several years and was delighted to find you had a recipe for a lemon bundt cake. This sounds very much like a lemon cake my mom used to make. She (and I, after her) would turn the cake out of the pan very soon after removing from the oven, poke holes in the top with a small skewer and brush/dribble the warm glaze over. (hot on hot, as some mention here) It was always moist and absolutely delicious. I wonder if you ever tried doing that as you re-tried the recipe, and how that worked for you. Also, how would Meyer Lemons work in this recipe, do you think?n I am anxious to try your version! oh, and I plan to serve this with some fruit sauces (huckleberry, strawberry) for my new granddaughter’s welcome party! I love lemon poundcake and the syrup really makes it moist and lovely. My solution to this is to pour the warm glaze over the hot cake, before removing it from the pan and after poking it with a cooking fork all over. Then when it is cooled it can be turned out and glazed with the icing. It is a similar idea to the Kentucky Butter Cake which I have made for years and has a hot sauce poured over while still in the pan. Let the cake cool in the pan and invert before icing, or glaze the top(which is my favorite part of a poundcake!). If a flat, cylindrical cake is OK, use a springform pan. If cake hasn’t already loosened from the outside, use a knife to do so, then remove the rim. Spray the rim with pan spray and return it to the cake. NOW pour on the syrup, which will be trapped. Once absorbed, remove the form again. I have cooked for years but am new to baking. The lemon cake (fabulous!) was my first real cake and I’ve made it several times. Question: When the recipe calls for 3 cups flour and the directions state “sift together flour, baking soda, etc…”, does one measure the flour before or after sifting? Thanks. My lemon cake fell apart today so I’m not baking another thing until I get this question sorted out. Love your website and look forward to your cookbook! Mary Jane — If it says “3 cups, sifted” you sift after measuring. If it says “3 sifted cups” you sift first. I always lean towards the former, as measuring from a sifted pile is annoying. This is one of my all time favorite cakes. I love that the recipe makes 2 loaves – one to eat and one to give. I’ve made it many many times – truly one of the best recipes ever. I know this is an old post, but wanted to update you on a variation. I live in SE Asia and lemons are preciously difficult to find and pricey, but limes (green and yellow) are readily available so we often convert recipes from lemon to lime. Making this cake today with lime instead of lemon – it is lovely, fresh and bright. Absolutely FANTASTIC! The strong tangy lemon flavor was exceptional. This will definitely go into the book of recipes to make again and again. Btw Deb, how many times do you test a recipe before it makes the cut for the public? Are you baking/cooking every minute of your life and what do you do with all that food? I find that with my orange cake with a orange juice and sugar icing it is vital that you put it on the cake immediately out of the oven…it has to be hot for the juice icing to be absorbed by the cake. LOVE this recipe. Thanks so much for posting it. It is delicious! I made it twice last week for Christmas parties. :) So glad I came across it! I made this the other night using meyer lemons and it came out really well. For baking pans I used tossable paper loaf pans and tossable paper mini-panaforte pans. Perfect for gifts. Happened to run across Ina Garten at a book signing and asked her about the sugar syrup. She said to add it when the cakes were still hot. I poked holes in the cakes using a round-tipped chopstick and poured in the syrup using a skinny mini-baster (borrowed from my Zoku pop maker tool kit). For the glaze, spooned it on, but kept spreading it and moving it around so it did not drip done the sides. I made this cake today in a pound cake pan. I greased the pan but did not flour, sides and bottom cooked browner and faster than the top. Still put on the syrup and glaze with no problem, am giving it to a friend. Next time will flour pan and put parchment paper in bottom. I hope it is also not the new pan, it is a heavy cast aluminum nordicware pan, I wonder if this type of pan requires temperature adjustment, did not say on package of pan when I bought it recently. Next time I also think I will use a different pan. Any experience with the bottom and sides browning much faster than the top with the 45 minute bake time? Also using a new oven. Happy Holidays from a baking perfectionada!! I have problems with the bottom and sides of cakes baked in cast iron cooking too quickly. I haven’t tried this one in cast iron, but presume it is the culprit. Made this piece of heaven last night, in a bundt pan. The outside did brown faster than the top. I flipped it out of the pan in under 10 min bc I wanted it to be warm to absorb the lemon syrup & it did- but I did have to “spoon feed” my lemon baby as you suggested. The cake was over the top fab. Had another slice this morning for breakfast & the texture was more of a pound cake than last night. Last night it was more of a lemon cake. Either way, it didn’t stand a chance! Hi Deb! I make a similar cake from Joy of Cooking, and I will quote directly: “As soon as the cake comes out of the oven, place the pan on a rack, poke the cake all over with a wooden skewer, and brush it with half of the syrup. Let cool in the pan for 10 minutes. Slide a slim knife around the cake to detach it from the pan, or tap the sides of the fluted tube or Bundt pan against the counter to loosen the cake. Invert it onto a greased rack and peel off the paper liner if using. Poke the bottom of the cake with the skewer and brush with some of the syrup. Invert onto another greased rack and brush the remaining syrup over the sides of the cake. Let cool, right side up or inverted on the rack” (p. 940). I am making your/Ina’s lemon cake today to mix things up, but these directions above go along with their Lemon Poppy Seed Pound Cake. It’s quite similar, and the above has worked well for me. Today I wanted one with a powdered sugar and lemon glaze over the top of the syrup, so yours is perfect for today! Thanks! Love all things lemon, so could not resist the idea that this would be oh so fabulous…even though I’d call myself a cook, not a baker. I made it with Meyer Lemons (on sale!!). It was good – not great, but I’m hashing that up to my extremely limited baking abilities. I made the 2 loaf pans version. Outsides browned more than I’d have liked, even though cake tester was still coming out gummy. I had the same issue with the lemon syrup absorbing, even though I did poke holes (alot of holes!). I didn’t think the texture was all that wonderful the 1st day, but will admit that it was better the next day. I’ll definitely make again, next time in the bundt pan. All in all – I’d recommend, but don’t serve to company on the day of baking, you’ll be happier with results making a day ahead. My Mom made this cake for my son’s 7th birthday. It’s his favorite! She made it in a 9×13 pan, and did not remove it after baking. She cut the glaze recipe in half and poured it directly on the cake right out of the oven still in the pan. It was heaven! She served it with raspberry sorbet. I’m going to try it right now. I’m making this cake for a second time. This time I’m making it according to the recipe with two loaf pans. Instructions are to invert them while cooling, then pour the syrup on. I wonder if pouring it on the bottom is a little easier. I also noted that the cooler they got the slower the absorption. I spooned the syrup on slowly since I didn’t want to miss a drop! I hope you’ve figured out the problem because a bundt cake is much prettier than loaf pans. Please update this post with your findings. Thanks! I can’t wait to have a bite. I made this cake using Meyer Lemons and it was a big hit- and it was very pretty in the bundt cake shape. I poked holes in the cake as soon as it came out of the oven and poured the syrup by spoon while it was still in the bundt pan. It absorbed all of it and I flipped it out of the bundt pan 10 mins later, poked a few holes on the top of the cake and poured an extra 1/4 cup of lemon syrup through the holes. Glazed it with the frosting 2 hours later when it was completely cooled. It cooked evenly in the oven and was done in 45 mins. I will def make it again. I just made this cake and it’s cooling as I type this. I made mine in a bundt pan (I also added some thyme that I had on hand) and I brushed the simple syrup on with my silicone baster brush. Worked like a charm. I made the orange chocolate chunk cake last week for a party – amazing! super orange flavor, very moist and dense. So I assumed that this one would be just as good – but it wasn’t, at all! I made the recipe exactly as written, but the texture of this one was not dense (more fluffy), and the lemon flavor weak. I was able to get all the syrup in there, so I don’t think it was that. This was just an ordinary lemon pound cake, ho-hum. What’s the difference, do you think? Hi, I just made this tonight and figured out how to get the cake to absorb all the syrup. I waited 10 minutes after pulling the cake out of the oven and then poured the syrup onto the cake while it was still in the bundt pan. Where it looked like it pooled I took a butter knife and slightly pulled the cake from the sides. I waited another 20 minutes or so and then inverted it onto the cake plate. It came out of the pan without sticking and tomorrow I will glaze it. Elementary, my dear Debson! Simply poke the cake all over with a bamboo skewer. Oh yes, I almost forgot! Apply syrup with a BRUSH…just made the cake again. Turned out great. I didn’t make it through all of the comments, so I apologize if I’m repeating a suggestion that someone else might have made. Before turning out the cake, pour the syrup on top and let it soak in. This should give you maximum absorption into the cake. I have a rum cake recipe that suggests this and it absorbs the syrup beautifully. wait, how many does this feed? My favorite method for “syruping” pound cakes (I do this with rum cakes frequently) is to make the hot syrup while the cake cools in the pan for a few minutes. Then, flip the cake out of the pan and pour half of the hot glaze into it. Then put the cake back in the pan and pour the rest over the cake’s underside. Let it soak up the syrup as it cools. When the syrup has absorbed, flip the cake out and pour on the glaze! YUM!!! I’ve seen lots of recipes that use sour cream or yogurt to make the cake moister. With all the talk above about how to get the syrup to absorb and make the cake moist, would there be any call to add sour cream to the recipe? I’m not much of a baker, though, so that may well be totally off the mark for some reason that I’m not aware of. My shop today. I think th glazing issue some are having is because of the butter flour “finish” that results from prepping the pan. I use a nonstick spray for everything and the i brush my warm cakes with warm glaze a few times. All good. Hi Melissa — Thank you. Love your shop! I made this today to serve with strawberries and whipped cream. Delightful. :) I didn’t have time to make and add the glaze, so it was less sweet than it would have been. I’ll have to try it glazed next time…or maybe on the remaining half. I’ve always wondered, could I use a normal tube tin instead of a bundt? I’m thinking it should work fine, but the icing drizzle would not have the same patterned effect. I have a quick question with this and other cakes – when measuring lemon zest (zested using a microplane), do you pack down the zest into the measuring cup, or just kind of spoon it in? It’s so fluffy coming off the microplane; I’m not sure how to handle it. Thanks! Hi Deb! In this post you mention that this cake is one of the top ten cakes every cook should know. I would love a post that includes the other nine, fun list! Can’t wait for the book tour! Wow! I’ve baked two lemon cakes (mother-in-law’s recipe) and my glaze was not like granny’s — way too runny. My 11 year old daughters found this blog today and I can’t wait to try your recipe. 3rd time’s a charm, right? #1 I love this blog! I cook from it constantly! #2 There is a lemon cake I make from another blog that you push a fork into the top of the cake and then pour a primary glaze of just lemon and sugar before the secondary glaze that is thicker. It gives it something to stick too and helps the cake not be dry. I skipped the zest this time and it just wasnt lemony enough. I did use half whole wheat flour and the cake was still light and fluffy. Must zest next time! Wow!! I made this last night for a dinner party. I ended up doing 2 cakes in a loaf pan and they were completely fabulous!! They were so moist and delicious. The lemon flavor is just right. Not too sweet either. The cakes were ready after 45 minutes in the oven. Have now made this twice, both times in loaf pans. One time with Eureka lemons, the other with Meyer lemons. I made no other change. The one with the Meyer lemons sunk, so the loaves were denser. Flavor was great both times, and I’ll definitely make this again. But, what could have caused the loaves to sink? I made cake in bundt pan and cake fell. however, what i salvaged was delicious so i am eager to try again, I am a novice so any suggestions as to how to avoid the cake falling will be appreciated! It’s amazing to me how long these comment threads can go. I was reading about this very cake that I made on Saturday, and am delighted to find others out there puzzling on the same topics. How to make it soak up the glaze… I think a key thing is resting the cake on a rack. I used a Bundt pan. Turned out beautifully and I ate almost the entire cake myself, but musing on how to make it more moist. Next time I plan to remove the cake from the pan and rest it upside down in a pasta bowl or some bowl that fits the crown of the Bundt. Then I will drizzling the warm glaze (thinner perhaps) all over, turning the cake to access the other sides. I might poke a few holes, but I think I’d rather inject some kind of lemony filling. Re lemony filling, lemon curd is a favorite. I bought some Dickenson’s (sp?) lemon curd and enjoyed spoonfuls of it on slices of my cake. YUM it’s a gas! Lemon Sweetness. There’s nothing like it. Better than chocolate. Thanks for your wonderful site! For inspiring us all the comment! I made this lemon pound cake in a 7 quart crockpot (because my oven is broke and I love to bake) and it took 2-3 hours to bake all the way through. Iinstead of an icing syrup I made a homemade fresh lemon buttercream frosting with fresh lemon juice and peels and iced it barely warm and sprinkled with my own colored RAW sugar (homemade sprinkles) oh so heavenly delicious! Next time I may try cake pops on the top of the woodstove because my barbecued cherry pie tasted like charcoal lol. When I made this cake, I cooled it on a rack until it was just a little warm, returned it to the Bundt pan and poured the syrup all along the side of the cake, so it ran down the space between the cake and the inside of the pan. I left it for a couple hours, then inverted the pan onto my cake platter and let it rest a little longer before serving. I didn’t use any glaze, just decorated with fresh flowers (it was May). While the syrup still didn’t really soak the cake, per se, it did penetrate somewhat into the body of the cake, beyond the crust. Made this cake yesterday, it is wonderful! Poured the hot syrup into the bundt pan a couple of minutes after it came out of the oven, let cool 10 mins (think I could’ve gone longer), and turned it out, no probs. Cake is drenched from the bottom about 2/3 up, crazy good – will definitely try the chocolate one, thanks! Just made this cake–again! It’s one of the best cakes ever! I do also poke with toothpick before I pour the syrup with spoon carefully. I cannot believe I suggest YOU something, but making tiny holes with toothpick and pouring the syrup with spoon work for me while cake is still in the pan. This is the first time I used buttermilk, curious about the results. I used to use either yogurt, kefir, or yogurt/vinegar mixture for my own buttermilk. I poured the hot syrup over the hot cake directly from the oven (still in the bundt pan), and used a knife to gently pull the cake away from the sides so that the syrup would slide down the sides to the top of the cake as well as the bottom, and let sit for 10 minutes or so. The syrup absorbed nicely. Topped the cake with a sheet of parchment and turned upside down onto my hand (cool enough then), to then slide onto a cooling rack. Worked like a charm. Served the glazed cake with a side of whipped cream blended with lemon curd. Wonderful! I have the original recipe when she made it on her show. The trick is when it comes out of the oven you poke holes all over it with a skewer or something about the size of a small straw, I use coffee stirrers. Then you spoon the icing over and it soaks way down in the cake. Lushness to say the least. Good Luck. Deb – I will apologize ahead of time for not reading through the 173 previous comments, but I’m pressed for time. But if you haven’t found a solution to your soaking problem, I have. And really, you pretty much had it yourself anyhow! Flip the cakes. Soak from the BOTTOM (and the sides!! ), NOT from the top. It works perfectly. I just made this cake for the first time for my hubby’s birthday, and it is really the most delicious cake ever. I made it in a 10-inch tube pan, which was perfect, and let half the syrup soak in from the bottom, then flipped it and soaked the rest from the top. The top of the tube pan baked cake had lots of nice cracks for the syrup to soak into. Then I glazed it, all while still warm. It is moist and fabulous, and hubby has had 3 pieces already. This cake is so tasty! I’ve made it twice now. The most recent version, I made in 5″ round layers and frosted it with lemon buttercream. People raved. And I have another very strong vote for making sure that your syrup is hot when you go to put it onto the cakes. I had to bake the layers in batches because I only have two pans (I got 4 layers, fyi). The first two came out of the oven just as the syrup was finishing up on the stove. I let the layers cool for ~10 minutes, then put on syrup with a spoon and it soaked right in, no problem. Then the syrup sat on the stove cooling off until the second batch of layers came out of the oven, and it was thick and cool when I went to put it on the 3rd and 4th layers. It wouldn’t soak in at all. So I popped it back on the stove, heated it up, and it soaked right in without a problem. I have made something similar, but in a bread pan. For that recipe, you use a wooden skewer to poke holes in the bread and then pour the syrup onto it. Let it soak in the pan before removing it and adding the glaze. I’m going to try this method because I’ve been wanting to make the lemon bread as a bundt cake and I think this recipe will work. I used a pastry brush to blot the syrup onto the cake. This is my first time making the cake and I haven’t tried it yet, but I can say that cake absorbed the syrup very well. No poking of holes in the cake is necessary with this method. Just made this cake for Easter dinner. I cooked it in two bread loaf pans — one was a bit smaller than the other, and when I took the cakes out, the bigger one fell a tiny bit in the middle! Oops. A bundt pan would have been better, so I’ll be purchasing one of those soon. I poured the warm syrup (not hot) directly onto the cakes in the pan when they came out of the oven. I let it sit for five minutes and the cakes absorbed up all of the syrup. Then I flipped them out onto a big tray and the syrup stayed inside the cake. Thanks for the great recipe! I made this tonight…wow…it is DELICIOUS!! This recipe is a keeper…I also made your oatmeal cookies and they are a keeper too. :) Thank you!! Hi Kim — Are you saying there was a typo? There are over 800 recipe posts with an average of 1200 words each in them on this site. It happens. I appreciate your letting me know, however, as I like to fix these things as soon as I see them. I made this cake about 2 hours ago. Simply D E L I C I O U S ! !, I must say. I opted not to make the glaze and syrup. This cake has just the right amount of sweetness and lemon-y taste (to me) w/out the addition of the glaze and syrup mixture. The crumb is perfect! Thank you for such a wonderful recipe!! Hum, I have a Duncan Hinds Tiara Pan from way back when. I wonder if this cake would work well in that. I think I’ll try it tomorrow. Thought i’d share the lemon cake my Mum’s been baking since i was a girl – it’s Mary Berry, who is the queen of traditional cakes, and the best thing is, there isn’t the the-syrup’s-not-absorbing-madness because it’s made with granulated sugar, not icing sugar, so the syrup doesn’t ‘solidify’ – instead, as it cools, the lemon juice sinks in and moistens the cake, and the sugar forms this incredible crunchy sweet topping on top that i defy you not to save until last, because it’s so gooood! Enjoy! Just made this cake but tweaked the syrup with a recipe from thekitchn.com. It uses thyme and ginger, though I subbed in lemon juice for the water it called for. It turned out wonderful! I used the loaf pans and it seemed to allow the syrup to absorb pretty well. I worked in a tea room that served a chocolate bundt that was infused with something. The chef left the cake in the bundt pan and poked holes, poured the syrup on and let it sit for a while before inverting it onto the cake stand and glazing. This cake looks great and I’m going to try it soon! Thanks for all the great recipes and ideas. Hi there! May have been too long but i made this YUM-azing cake last night for a party today. It was outstanding. I’m not sure how long you baked yours? I baked this about thirty three minutes..until a cake tester *juuuuust* came out clean, then let it cool in the pan about three minutès. I put parchmeñt on a cooling rack and tipped the cake out then used a turkey baster to distribute the syrup over a baking sheet. ALOT of it was left but alot went in also. Im thinking maybe cook time had something to do with it? Anyway…was moist and delicious. Thank you. You’ve probably long since solved your absorption problem by now. . . it’s funny, though, because I’ve struggled with the opposite! I used to make a great lemon pound cake that included lemon yogurt. The glaze was something crazy like 1/2 cup powdered sugar and 1/2 cup lemon juice; I was always frustrated that it all just disappeared inside the cake. So you might try upping the amount of liquid for better absorption. Just a thought! I made this in loaf form for a friend’s birthday this weekend and it was wonderful! A bit of summery flavor to distract from all of this michigan snow. This recipe is delicious! I just harvested 23 Meyer lemons off my Northern Nevada winter indoor tree and made it in loaf pans so I could ship one to DC and one to Hawaii for birthday surprises. I’ve made it with regular lemons and found I needed to zest more Meyer lemons (I stopped at 10!) as the skin is softer and thinner, so used about 1/4 cup zest but it was still tart and yummy! This ships well, chilled it outside(36 degrees), wrapped it saran wrap, then foil, then sealed bag, and shipped them coast to islands, and 3 days later reported to be moist, and ever so tasty! Thanks to my daughter for sharing this recipe and giving me the cookbook for Christmas! For the lemon glaze…my family always uses 1 can minute maid frozen lemonade, juice of 1 lemon squeezed in and a touch of lemon zest – 1 1/2 boxes (1.5 1bs) powdered sugar- whisk it on the stove until warm/smooth texture- not long – then glaze the cake right from the oven – while both are warm- never fails!! You will have enough glaze for 2 cakes! For the lemon glaze…my family always uses 1 can frozen lemonade, juice of 1 lemon squeezed in and a touch of lemon zest – 1 1/2 boxes (1.5 1bs) powdered sugar- whisk it on the stove until warm/smooth texture- not long – then glaze the cake right from the oven – while both are warm- never fails!! You will have enough glaze for 2 cakes! I use a thin knitting needle to put holes into the cake – works very well. My daughter was at a conference in New York City last year (I believe it was connected with Women’s Health) and you were in attendance. She is a professional Rock Climber and has long been a fan of yours (check out her new website paigeclaassen.com). She returns to Colorado tomorrow after her international tour (LeadNowTour.org) to support women and children across the globe. I have made your lemon cake for her homecoming and added blueberries. It looks fabulous! I think she will be excited that you are a part of her homecoming! I made adjustments for altitude and it looks perfect! Thank you for inspiring not only Paige, but her mom, too! I make this cake for my children’s birthdays but I don’t add the glaze, I bake it in 2 round cake pans and frost it with cream cheese frosting. Everyone loves it. I’d bake it at the same temperature. For the cake pans, it’s hard to guess but it never hurts to check in at 20 minutes and then every 5 minutes after if it’s not set yet. Most cake layers range from 20 to 35 minutes, longer for a deeper one. I want to make this as a layer cake! Did you try it? I want to frost it with cream cheese icing but I’m worried it won’t adhere well because of the syrup. Deb, I made this recipe last week and it got rave reviews from all who tasted it! Great lemony flavor. I’m even bringing dessert to a dinner and my suggested that I make this. I meant to say that my boyfriend suggested that I make it again for my upcoming dinner! I was reading some of the responses about how to get the lemon syrup in the cake after baking. I bought a hair pick to make tiny little holes, pour the syrup on the cake when it comes out of the oven and it gets the result I want, moist cake! When you’re pouring or spooning a glaze over a cake, my sister came up with using an uncooked strand of spaghetti. It pokes smaller holes thereby you can make more holes and more syrup gets inside the cake, the holes go all the way to the bottom of the cake which makes the entire cake moist and the holes made by a knife are just too big. I must confess, one time my spaghetti strand broke in half, I wasn’t being very careful, but no one ever found the broken uncooked spaghetti strand. It must have been absorbed! Hope this is helpful. Try 3 cups of sugar, using 2 1/2 cups in the batter. I did this by accident the fist time I made this cake by Barefoot Contessa Ina Garten, and went back to this after making the cake correctly the second time. I always get rave reviews when I take this cake places. I do like the idea of a bundt cake rather than two loaf pans! Try inverting the cake, poking holes in the bottom with a skewer and then pouring on the syrup. Long time baker’s approach to moistening a cake with sugar syrup. Has anyone tried making cupcakes with this recipe? I won’t be using the glaze, huckleberry cream cheese instead. I haven’t. This is a pound cake style cake, so it might be a touch more dense that cupcakes usually are, but no less delicious. I’m not sure if anyone suggested this because of the many comments listed, but you could slice a layer below the top of the cake and spoon the syrup onto the cake part. Then, replace the layer and drizzle the glaze over that…Just a thought. Poking holes would work, too! Pour the glaze in the pan, bundt or otherwise, then return the warm partly cooked cake. Let rest 1-2 hours then turn out!!!! Luscious….I do this all the time with mine! I’ve done this recipe a number of times and it has become my go-to cake recipe. I always do it as a bundt. I didn’t have much of a problem getting the syrup into the cake the first time. I let it cool, popped it out of the pan, and poked holes in the top. I put the syrup in the bottom of the bundt pan and re-inserted the cake into the pan and allowed it to absorb that way. The second time, I misaligned the cake and broke it in half trying to get it back in the pan, which led to much frustration, some cursing, and giving up on the syrup. Moving forward, I think I will release the cake from the pan and immediately put it back in. Poke the holes in the bottom of the cake and ladel the syrup from the bottom. Best of luck! Love this cake! My five-year old daughter and I just won second place in our town’s annual baking contest with this cake! It’s a big favorite with the seven-year old for tea parties, too. Thanks for a great family staple and some happy summer memories! And if anyone’s keeping track, we use a chopstick to poke holes in the bottom of the cake as soon as it comes out of the oven and then spoon the hot syrup all over the bottom; wait 5 minutes and turn it out onto a rack to finish cooling. Fast and easy! Did the same as Amy and used 2.5 cups of sugar in the batter. It was sweet but still delicious. Used Meyer lemons for zest and juice. Took to an end-of-the-summer party and was asked for the recipe 3 times. Next time I will try poking holes in the bottom for spooning the juice, too! Forget the lemon glaze entirely. Use Mark Bittman’s buttercream frosting, substituting lemon juice for the cream or milk. Just as lemony as the glaze, easier to apply, and looks enormously festive–perfect for the tart lemon lover with a birthday. Has anyone converted this recipe into grams or ounces. Just a weight measurement for the flour would help. I would like to have consistant results EVERY time, and weighing my ingredients is so much more accurate. Thanks for any help – this is to be a gift for a special friend and I would like it as perfect as possible. Hi Darlene — I’ve added the weights for this recipe. Enjoy! What was your complete baking time for the recipe in a bundt pan please? Same oven temp? Same temp, sadly, did not jot down the baking time. That said, with <a href="https://smittenkitchen.com/blog/2006/09/this-cake-has-a-hole-in-it/"other bundts like this I’ve made, the baking time is the same, so check in at the regular time and you can always put it back for 5 or 10 more if needed. We have a lemon blueberry cake-bread recipe that’s been handed down for generations. After baking but while warm (not crazy hot), you poke holes in the top of the cake and the pour warm lemon-sugar mixture over it very slowly so it sinks in. Maybe if it was a two-part process – the holes+warm lemon-sugar mixture, then when cool, ice just for icing’s sake, not for moisture. That’s what I’d try, and my family has produced some amazing genius cooks through the years. I made this last night in bundt form. After reading many of the reviews I poured half the syrup on fresh out of the oven then let it cool for 10 minutes then flipped it over. I should have known there would be trouble when all that wonderful syrup pooled on the edges and around the center thingy. Yep, it stuck and tore off chunks when I flipped it over. I poured the rest of the syrup over the torn bits, pieced it together and let it cool. Since I had committed to taking it to work today I found a pretty bowl to flip it back in and then glazed it as it was. I presented it with humor today and it was devoured in no time! It really is delicious. I will make again but I’ll be safe and not go the bundt route this time. I made this in bundt form and did the bottom-of-hot-cake-hole-syrup trick that some commenters recommended, and it worked beautifully! Also used a basting brush to apply some of the syrup to the top crust (in small amounts) to soak in before glazing it. Nice sweet crispy crust and moist interior! In my convection oven on 350F it only took about 45 minutes. Oh, P.S. to the note above: I used a wooden kabob stick to poke the holes (nice and long, reaches down to the other side of the cake easily!) and I subbed some orange zest and juice because I didn’t have enough lemons on hand. I don’t know if this would work on your cake here, but I make a prune cake with a very similar glaze step, but it is poured over the hot cakes right in the cake pans. It bubbles and spurts but the heat helps distribute it throughout the cake. I might just try this and see. Ooohhh. This is not your fault, not at all. Hurrying thru the recipe, I was, and failed to notice some of the divided ingredients. Grrr. So I thought I’d ask, very humbly, if you’d consider putting “, divided” after these, in future, to help out twits like me? Well received at the shower, and my coworkers are loving the leftover loaf at work this morning. The syrup I just applied with a spoon? Very slowly drizzled. A lot ran off, but enough absorbed to help keep the second loaf moist and delicious, even two days later. Will definitely be making these again – well worth the effort. The chocolate cake was also well worth the three stores I had to go to before I found the dutch cocoa – so intensely chocolatey! Freezes perfectly! And the cream scones even impressed my mother, who is an excellent baker herself, so thanks for that sense of accomplishment! Couldn’t have pulled it off without your excellent recipes. Could this be converted into a layer cake for birthday purposes? I ask because I haven’t found a lemon/lime layer cake on this site. Deb, the cake that you have posted in response to this question in the past is not itself a lemon flavored cake, but a yellow cake with lemon glaze, and that won’t work for the lime-loving machine that is my husband. If I did try to make this into a layer cake without any modifications, what would happen? Also, what frosting would you recommend? CJ — I don’t see why not, although as a pound cake-style cake, it might be a little sturdier than your standard yellow layer cake. I’m not sure I completely followed your second part, about the yellow cake with lemon glaze (this is of course a cake with a lemon glaze too, though no reason not to use lime in place of lemon in most cases). A cream cheese frosting might be nice, or a vanilla buttercream. Thanks for the quick response Deb! Sorry for the confusing comment – I meant that I need a cake recipe that has lemon (or in my case, lime) in both the cake AND the curd (which I’ve decided to add as a layer for this birthday cake). I think I’ll try this with a whipped cream frosting and I’ll cut the cake into several layers to balance out its weightiness. I’m excited to try it! Thanks for posting such great recipes! Has this been said already? I doubt this is original, with over 200 comments before mine, but I always put syrup on with a pastry brush. It takes a little more time than pouring but all the syrup is always absorbed that way. And I poke holes for good measure. This cake is awesome. If I serve it for Easter I even candy some lemon slices for the top, just to gild the lily. Mark……..Formerly online as Boscoe the Cookie Doctor. “someone stole my domain when I wasn’t looking! how to make do in central america when you don’t want to spend $50 on a full-size bundt pan and the shop has a half-size for only $10… half the batter in mini-bundt, half in a 9-inch round…. i’ll stack them in the cake carrying plate for traveling to the birthday party. and then i didn’t read carefully enough during early morning baking and added the full 2.5 cups of sugar to the batter. whoops. so i bumped up the rest of the stuff a tiny scootch as well and hoped for the best. very full upon baking but damn those tiny stuck bits that i scraped out tasted delicious. my version of the notorious syrup infusion for any it might help (i know i read all the comments before starting!) – i poked holes with my cake tester all over and then used a silicone pastry brush (with the rectangular bristles on the inside that have holes in them to hold more liquid) and brushed the syrup over the tops of the cakes until it was all gone. worked pretty well. then the waiting ten minutes and inverting onto a cooling rack. i’ll put them on the cake plate before glazing but so far they look great! I make a similar cake in a 9 x 13 pan. When it comes out of the oven I poke holes with a chopstick and spoon syrup over. I serve it with lemon yogurt and lemon curd mixed. Delicious. Like another poster, I had issues with this cake burning on the sides before it got done in the middle or browned on top. My oven temperature (I have a thermometer) is accurate, and I followed all the other instructions to a T. A bit frustrating since I used a decorative pan and now I’ll have to scrape all the pretty parts off to get the singe off. What can I do to prevent this in the future? Jenny — I’m surprised this is happened, as 350 is pretty standard for cakes and bundts, however, this matters less than how to avoid it: bake it at 325 next time. It will take a little longer, but lower temperatures are always the solution when a cake gets too dark on the outside before it’s baked in the middle. I bake this cake every year with the Meyer Lemons I grow from my own tree. I bought the tree from Loews…put it in a large pot next to a sunny location and what a crop of lemons I grow! Each lemon is huge and so fresh. I recommend buying a lemon tree to anyone who loves to cook. A $25 tree produces about 30-40 lemons each year. I made this for a birthday this weekend. It was delicious and especially bright and lovely on a rainy night. I put about 1/2 of the hot syrup on hot cake while still in the bundt pan, and then flipped the cake out and brushed/poured the rest on. It absorbed just fine and was totally delicious. I may have measured poorly, but ended up with a lot more powdered sugar glaze than I needed. Boo hoo, not a bad problem to have…. Another keeper! 1. Dark or anodized pan absorbs and retains more heat. Cakes bake from outside inward. Too hot a pan will cause the exterior to set and bake too fast. Reduce temperature by 25 degrees and start checking for doneness 10 minutes before recipe indicates. 2. Too much fat was used to grease the pan. After liberally greasing the pan, brush over the interior with a pastry brush to remove excess and ensure there is no build up of fat in the nooks and crannies. 3. Flour protein is too high (“strong” flour). Higher protein flours will have more Maillard reaction than lower protein flour. Maillard reaction is the caramelization that happens when heat is applied to sugar, proteins, amino acids, or peptides. Flours for cakes should have a protein content at 10% or lower. All purpose flour proteins vary by brand. For instance, King Arthur unbleached all purpose flour has a protein content of 11.7%–much to high for a cake. Gold Medal and Pillsbury are 10.5%. Cake flours are between 8-9%. Low protein flour also makes a more tender cake. 4. Too much sugar in the recipe–the higher the sugar content, the more intense the maillard reaction. 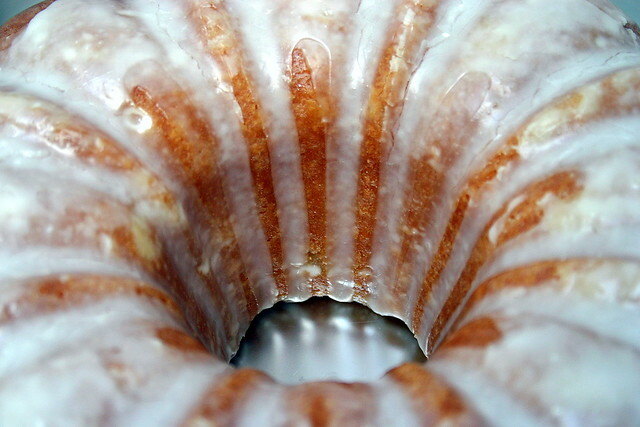 I assume you could do the same with the lemon glaze – the sugar glaze covers the holes nicely. Baking recipes usually call for large eggs. This recipe calls for extra large eggs. When I made this, I used four large eggs and it came out fine. But, should I have added an additional large egg or the yolk or white of an additional large egg. Have you tried this again and have you had any more luck with the icing? I’m going to make it this weekend for a Christmas Tea and thought I’d check! Absolutely love your blog and recipes. My husband can’t get enough of your whole grain potatoes I made him last month! Can this cake be made ahead and frozen? Without the icing of course. I don’t think the iced glaze will look great from the freezer but everything else will be perfect. I’d put the glaze on once it’s out. Made these as loaf cakes today, other than over baking them a few minutes and letting them get too dark they turned out great. I poured the syrup over them while they still sat in the tins, let them sit a few minutes then took them out of the pans … no excess syrup, it had all absorbed and the cakes did not fall apart. I will be glazing these only to try to take away from the darkness as they are for a bake sale tomorrow otherwise I would leave the glaze off. I’m in the middle of making this cake tonight. I followed your technique and used a pasty brush for the syrup. It soaked right in. Thanks! Holey moley. As I was making this, all I could think was how beautiful of a batter it was. This is my first pound cake, but good god. So luscious. I streamlined dishes by: pre-cracking the eggs into one of the level measuring cups already used; mixing the buttermilk & lemon right into a graduated glass measuring cup; using the bowl of ingredients to whisk together the final glaze/icing. With these steps, plus the freezer stash of zest and lemon juice from our backyard harvest, the cake came together quite easily. I did not have buttermilk, so I used plain whole-fat yogurt, thinned out with a bit of milk. I followed others’ recommendations to poke holes in the bottom to soak up syrup, which worked well. One hiccup is that my cakes did stick quite a bit to the plate as they cooled. I was able to mostly save one by using a thin spatula to scrape up the detached hunks and replace them. Next time, I’ll try slipping a piece of parchment underneath during the syrup-ing phase and see if that helps maintain a clean top. I can’t wait to dig into this for dessert today! Ridiculously good. Worth the effort. It’s amazing on it’s own, but Inwould still use less drizzle. Drowned a bit in it. Another keeper. Poke holes in the cake with a kebab skewer? I just made a cake very similar to this one but with blueberries in it. I did poke the cake all over with a toothpick and brushed the lemon syrup. I did not try to brush it on all at once but let things soak in for five minutes then brushed again and kept that up until I ran out of syrup. I had very little puddled at the bottom. And I just spoke to my brother who received the leftover cake and he commented how lemony the outer “crust” of the cake was. I did not make a thicker glaze but dusted the cake with powdered sugar. I thought the whole thing was pretty yummy! Have you tried Lisa Yockelson’s Ultra Lemon cake? It has a lemon soaking glaze that’s thin and watery (but very lemony) and a lemony pouring glaze that’s more of an icing. It’s my go-to super moist lemon cake, but I don’t make it often because we eat it entirely too fast. The recipe sounds complex,(make your own lemon sugar, really?) but the end result is totally worth it. I have the same kind of love affair with Ina’s other version of this—the Lemon Yogurt Cake in her At Home cookbook. It also calls for spooning syrup over the turned out loaf. However, I decided it absorbed better and faster if I, 1) left the loaf in the pan, 2) poked holes in the top with a wooden skewer, then, 3) spooned the warm syrup over the top. It still takes some time & patience, but the moister cake is worth it. Now I’m seriously considering something like a meat injection syringe! Haha! Thanks for your cooking inspiration! I quit making Ina recipes because they never turn out right. I need to weigh in. We make a very similar cake in our family. 3 cubes butter, 3 cups sugar, 5 eggs, zest from 3-4 lemons, 3 cups flour, 1/2 tsp. salt and bp., 1 cup whole milk, 1 T. vanilla. We bake in a bundt pan. 325 for 70-80 minutes. While it bakes we juice lemons – 3/4 cup and mix with 1 lb. powdered sugar. When the cake is done we let it sit on a cooling rack for 5 minutes, invert and then put back in pan. We poke a million holes deep into the cake with a wooden skewer and pour all but 1/2 cup of lemon/sugar mixture over the cake. It soaks for a minimum of 6 hours. We then invert onto a serving plate and slowly spoon remaining lemon/sugar mixture over top. I’ll have to try the buttermilk/lemon juice version to see if it is as good as ours. Look at KAF lemon bliss cake recipe. It has a glaze & icing. Ive made it & had no issues with the glaze & icing. It is a keeper. I find the two things that help to get the lemon glaze to absorb into the cake as well as glaze it are to make sure to pour it on when the cake is still *hot* and also to stab the cake judiciously with a skewer to create glaze-penetration portals. I placed my cake on a cooling rack with waxed paper underneath and drizzled the glaze over it and then transferred it to a plate. No cementing to anything .. I use an afro pick to poke the cake. Works great. Yikes, I walked off and let my lemon juice and sugar boil away, can I still use this? What’s left in the pot, just candied pistachios? I watched a video on Martha’s website where she makes a lemon bundt cake. I checked her recipe, and I copied her instructions below. She has the step of poking holes, and notes that it is a COOLED cake, not a hot out of the oven cake. Ina’s lemon cake is in the oven now- I’m going to try Martha’s technique on Ina’s cake. So, I think the cake should be upside down when you’re pouring lemon syrup over it. I did it like this and the syrup absorbed perfectly into the bottom of the cake. Now I’m still waiting for the cake to cool completely so I can turn it back up the right way round and drizzle it with lemon icing. So things could still go wrong…. Deb, I agree that Ina’s lemon cake is one of the best cakes in the world, and I’m excited to try it in Bundt form. I’ve never made it in any form other than the humble and less interesting loaf form, but that iteration does seem to absorb the lemon syrup quite well. Perhaps it’s the steeper curve of the cake and the inevitability of gravity that make it pool at the bottom rather than soaking in. Just a thought. Made this cake for a family gathering and everyone loved it. The cake is intensely lemon, and I found myself wondering about a cream cheese frosting instead of the icing. The flavor reminded me of my grandmother’s lemon bars. Also, made as a bundt and at 45 minutes I covered thecake with foil and baked for a further 15 minutes. The cake rose proud of the pan and, thankfully, didn’t run out of the pan. Hi, Deb – I’m very late to comment on this, but I too made Ina’s lemon cake and had lots of syrup running down onto the plate. I just looked at my grandmother’s recipe for lemon cake (from the 30’s!) which I used to make lots of times and never had a problem with syrup not absorbing. Her technique is similar to what others have suggested here: Put the syrup on 5 minutes BEFORE you take the cake out of the oven. As soon as you take it out, baste with any (small) amount that collects around the edges. Her recipe was for the loaf pan – it might be harder with the Bundt but still might work at least for the bottom half, and then you could baste the top immediately after you take it out of the pan; and use the poke holes method too. Love your recipes and your writing-and I was a journalism major… Thank you! I have made Ina Garte’s lemon pound cake more times than I care to think about. Every time in loaf pans, so that ,yes, I get one for just my family. When the cake comes out of the pan, I leave it upside-don on a rack and stab it many times with a skewer. Do not have problems with absorption of lemon syrup. Hope this is not too simple an answer. BTW, one time I forgot and totally burned the lemon syrup to a crust. When I peeled it of the pan. Said pan was cleaner and shinier than ever before! I think this cake might soak up the syrup better if you poked it with the handle end of a wooden spoon. I’ve only seen this done in Texas and Oklahoma, but it sure does help the syrup soaking. Have you tried that? This cake a little time consuming but following all the steps is SO. WORTH. IT! I have made this cake several times (in a bundt pan) and it’s always delicious. My trick for the glaze is to brush it on, rather than spoon it on. It works great. I’ll usually go around the cake a couple times, wait a while and come back for another couple rounds. I tried spooning on the glaze a few times and even with pricking the cake with a fork, it didn’t work for me either. Again, love this cake! And it looks so charming in a cake stand, too. I made this cake yesterday. I used 5 large eggs (instead of 4 xl) and poked holes with a toothpick before putting on the syrup (per other people’s suggestions). WOW this cake is SOOO good! Thank you so much for the recipe!! Not sure how this important step got lost in the recipe! I’ve been making this since I was a little kid, and one of the most fun parts of making this cake is using a thin bamboo skewer to poke holes in the cake right before you put the glaze over and then watching as the glaze disappears into the cake! Do you have something like this lemon cake for Passover? My family love it and I would like to give it a try. I do not keep kosher, but wouldn’t serve a regular cake for a Seder. Just put the Lemon Cake in the oven. What an I to do with the extra 1/2 cup of lemon juice? The recipe calls for 3/4 in the ingredients and 1/4 in the directions. oops, to early in the morning to be baking, I read the recipe. Hello! I make this cake, in loaf pan form, regularly – it’s a family favorite! I cook down the lemon syrup until it’s thick and then brush it on with a silicone pastry brush. The cake absorbs the syrup perfectly every time! I also prefer to make this cake in a bundt pan, it just seems more attractive to me. I use a silicone basting brush to get the syrup to soak in. Although, I must admit that it is time consuming as heck. The last few tablespoons always get dumped on as my lack of patience gets the best of me. The process does seem to go faster once the top has been moistened a bit. I agree with you, this cake is definitely top 10. I would like to find out what you think are the 9 others are…just hoping to find something amazing and new. Love you website and blog. Keep up the fantastic work!! Hey pal, I used the pointy end of a chopstick to punch wee holes in the cake and it drank the lemon syrup up faster than a thirsty drunk. Could I use olive oil instead of something else(butter perhaps?) or would that affect the cake too much? That is the goal. i wanted to make a lemon-olive oil cake, but how much olive oil? Hello- if I am making two bundt cakes, should I make them one at a time? Or is it okay to double the recipe and bake them together? 50th birthday dessert for 20 people! Depends on your oven but it should be fine, just move them around (top to bottom, rotating) a couple times to make sure they’re baking evenly. Made this yesterday to enjoy today for Father’s Day. Served to adults and kids, all with varying tastes. It was loved by all. This cake is OUTRAGEOUS. Dare I say my favorite cake I’ve ever made? Cakes are one thing that I find typically taste better when someone else makes them for you. Not the case here. It was objectively delicious. The family has all gone home and I’m dreaming of the slice I’m absolutely going to eat for breakfast. The Starbucks Lemon Pound Cake is one of my favorites and for the past year I have tried various recipes to make my own. Most of them were not lemony enough, or the lemon juice tasted odd after baking (too sweet). This recipe is the most similar; not as dense, but overall a lot better since it is fresh. All the zesting is so worth it! The first time I made it lemons were over $1 each, and even then it was worth it. Like others suggested, I use a basting brush for step 5 and dab it on. It’s usually enough to cover the cake twice. The hot cake (inverted on a cooling rack) has absorbed the hot syrup every time I’ve made it without having to poke it. Several times, I have served it after that step with powdered sugar and skipped the glaze, but to get the nice thick Starbucks-like glaze, I use powdered sugar, water and lemon oil (not lemon juice!). This and the double chocolate banana cake from this site are now my favorite bundt/loaf cakes that I make frequently. I have been making this cake for children´s birthdays for quite some while, but last time, I miscalculated and used only half the recommended amount of sugar. Surprisingly it did not affect the consistency, baking time or taste recognicable to anyone who knew it and had a piece. I also feel it is entirely unnecessary to stab the poor cake, the sirup is absorbed very well by the still hot, turned cake as is. Thanks for all your awesome recipies! Love and use your site frequently. I slowly poured the warm syrup over the cake-I made a bundt cake-after it had cooled 10 minutes in the pan. It came out of the pan perfectly. It is deliciously moist! Actually got a cookbook from a thrift store whereby someone left a recipe card and letter inside the book for a Golden Bacardi Rum Cake which uses a standard “yellow cake” mix that requires spooning Bacardi Rum and sugar syrup down side of cake after it is baked, (also uses a Bundt pan) but the woman wrote on the card that she removed the cake from the pan, than pour the syrup in the Bundt pan, than put the cake back into the pan. This worked well and the syrup is pushed up the sides of the pan when cake is re-inserted gentle back into pan, thus left to absorb for a couple of minutes. Since pan was already greased and floured, it shouldn’t stick. best lemon drizzle cake recipe ever, moist and fragrant. tried Mary Berry’s and one from bbcgoodfood (which has over 1600 positive reviews), and this wins hands down. i used meyer lemons, which probably brought this up to another level. i skipped the glaze as it was already very sweet with the syrup. Hey Deb, I know this is an “old” recipe for you, but you did ask if anyone had a a trick for the basting! I love this cake, but I too, was frustrated at the way the syrup just ran off the cake. My solution? Flip it upside down. The bottom of the cake is not as “crusty” or as smooth, and as long as you take a little time, it will absorb the syrup without a hitch. I made this last night. It was delicious! I read the tips about pouring the syrup and had no issues. As soon as I took the Bundt cake out of the oven, I put it on a rack (right-side up) over a baking sheet and started making the syrup. When the syrup was done, I poked holes in the top of the cake using a metal skewer (about half-way through). The syrup was absorbed completely. The cake was a huge hit at dinner. The orange chocolate chunk cake sounds fantastic too and may be next on the list of cakes to try. Made this cake yesterday as my mom requested a lemon pound cake for her 80th birthday :) It was DELICIOUS… but I failed to note that I was to add only 2C of sugar to the batter, and reserve another 1/2C for the syrup! I did catch myself after I creamed butter and sugar and went ahead anyway, and then I was more careful with the lemon juice. I know, I’m supposed to read through the whole recipe and then remember what I’ve read, fully appreciating all the details. BUT… would you please just add “(divided)” in a little teensy note in parentheses after ingredients that go in at different places or times? It would be so helpful! This cake was fantastic. I poked a bunch of holes with my cake tester and slowly drizzled the syrup by the spoonful with the cake on a rack over tinfoil covered sheet pan, then just poured the syrup back in the cup and drizzled again. After about four times I had less than a teaspoon of syrup unused. Everyone loved it. Subbed margarine for butter as my family does not tolerate dairy well. This might be a perfect gift cake – travels well, not temp sensitive, and still tastes good a week later. My solution? two 8 X 8 pans. Or a loaf pan. Line them with parchment paper, with extensions on the sides to lift out. Then poke holes in the top and glaze while warm. After a time, when cool, really cool, lift from pans using parchment paper handles, carefully. Add more glaze as a kind of icing. The advantage of the 8 X 8 is that it is not as deep as a loaf so the glaze penetrates more. I mean add the syrup while the cakes are in the pans, then glaze after cooling. I wonder if poppy seeds could be added to this without changing anything else? If so, Any tips on amounts? I’ve made this cake as a “Margarita” cake. Use lemon and lime zest in the cake, add tequila to the syrup, and tequila to the glaze. I’ve even topped it with flake salt! Delicious! Kathie, I’ve had similar results with a chocolate bundt I made once, and haven’t made one since. So I’m definitely hesitant to make this one as a bundt. I’m curious what the solution is, as it doesn’t seem like other people have had that problem? Would love some tips! It is my go to recipe for the lemon season. Made it on many family gathering and everyone loves it. It is moist and not overly sweet. Definitely my only recipe for a lemon bunt cake! Does anyone know how much these forms hold? Either loafs or bundt? Firstly I use metric system, and secondly not all bundt forms are the same size. Thanks! Which forms? Bundts are generally 10-cup or 12-cup; I believe this is that latter but it also doesn’t fully fill it. Is there some easier way to zest that I don’t know of? Zesting 6-8 lemons sounds horrible to me- maybe I just have a really bad seater?